If you plug any electronic component or device directly into the wall, you leave it vulnerable to dangerous power surges and spikes. That's true of audio/video equipment, but also your phone and tablet. The Panamax Power360 P360-8 shields each piece of gear in your home theater system and protects your charging mobile devices. 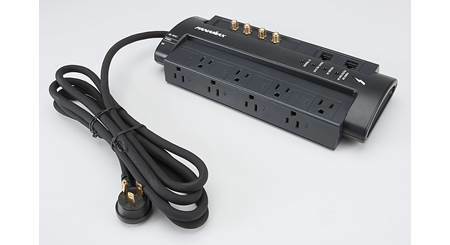 You get eight protected AC outlets, a telephone line input/output, and a set of coaxial input/output jacks for your cable TV or antenna connections. Also, two detachable USB modules are included with 6-foot cables — giving you flexibility while you safely charge your phone or tablet. There are four protected, high-capacity USB charging ports in all. When a catastrophic power spike hits, like from a lightning strike, the P360-8's Protect or Disconnect™ circuitry reacts in less than a nanosecond, instantly switching off power to your equipment. Then it automatically resets itself when voltage returns to normal. Panamax's SmartGuard feature provides similar protection when under-voltage (brownout) or over-voltage conditions exist. Again, power to your gear is automatically disconnected until voltage returns to safe levels. Keep an eye on the status of your protection, wiring, and voltage with Panamax's Circle of Protection™ LED indicator. It's a multi-color display that gives you a real time report you can read at a glance. Easy to use, great build quality, fortunately haven't had to test it's surge protection abilities yet, but have no doubt that it will perform well knowing the Panamax name! 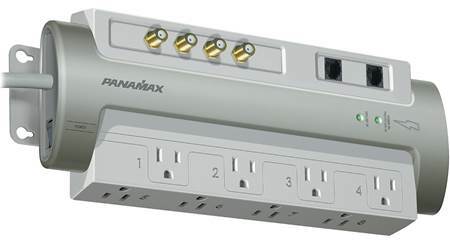 8 AC Outlets: The Panamax P360-8 is equipped with 8 surge protected 3-prong AC outlets, controlled via a power on/off switch. Surge Protection: The Panamax P360-8 provides protection of your connected devices through Protect-or-Disconnect + SmartGuard technology. Protect-or-Disconnect: The Panamax P360-8 keeps your electronics safe from power spikes by disconnecting load in a catastrophic event. the incoming voltage falls below 95 Volts or rises above 140 Volts. Then it reconnects when the voltage returns to a safe level. LED Indicators: Three LED indicators monitor the outlet wiring, voltage, and protection status. These LEDs can be switched off. Protected: This BLUE LED indicates that the P360-8 is functioning properly and that all connected equipment is protected. If the LED is off, this indicates that the power is disconnected from the outlets or that the switch is in the off position. If this light is off, but the Voltage light is illuminated Blue, then the Protect-or-Disconnect feature in the P360-8 has protected your equipment from a catastrophic surge event and disconnected power. Wiring: This Blue LED indicates that the wall outlet is properly wired and grounded. When this LED is Red, it indicates an open ground (no ground wire) or reverse wiring (polarity) condition is detected. Voltage: A Blue LED indicates that incoming voltage is within a safe range. When the LED is RED, this indicates an over-voltage or brownout condition and that P360-8 has been disconnected power to connected equipment to keep it safe. The P360-8 will automatically reset when voltage is back within a safe range. RFI/EMI AC Filtering: The Panamax P360-8 provides AC noise filtering to reduce radio frequency and electromagnetic interference. Signal Line Protection: Universal coaxial (RF in/out) and telco/DSL (RJ-11 in/out) protection prevents signal lines from carrying damaging electrical surges while maintaining full high-definition video and high speed internet signals to your equipment. Modular Charging Stations: The P360-8 features two modular charging stations that are each fitted with two USB (type-A) ports for charging smartphone and tablet devices. 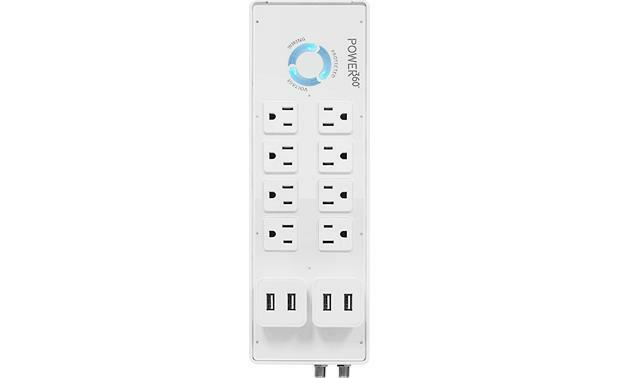 With a total of four USB charging ports, you can charge four devices simultaneously at 1A maximum for each, or charge two devices at 2A maximum for each. These patent-pending modular charging stations can be removed from the surge protector and placed on your desk top or tabletop using the included two 6' micro-USB to USB cables. 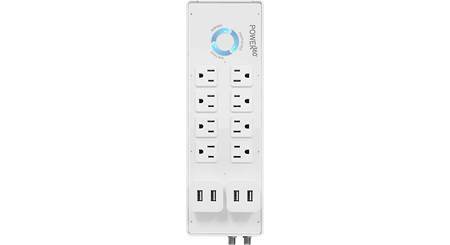 This allows you to place the surge protector on the floor, while the modular charging stations can rest on your table or desk. Power Cord: The surge protector features an attached 6 ft power cord with a right-angle, 45-degree offset three-prong plug. Warranty: The P360-8 has a lifetime product warranty plus a $500,000 connected equipment protection policy. Click here for full warranty details and restrictions. 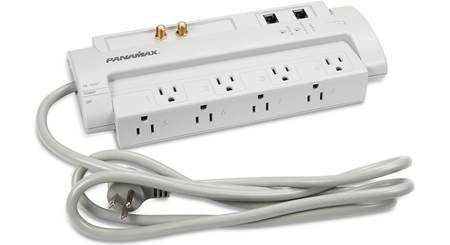 Searches related to the Panamax Power360 P360-8 Surge protector with detachable USB charging ports.